The Instituto Allende is a Spanish language and Art school in San Miguel de Allende, Guanajuato, Mexico. I recently attended sculpture classes there, and found it enjoyable and worthwhile. The Instituto offers Spanish classes, and a wide range of art classes. Group classes in Spanish as a second language are offered in various intensities, with one, two or six hours a day of instruction. Private tutoring in Spanish is also available. More than half of the students at the Instituto are there to learn Spanish. Hands-on art classes include painting, drawing, sculpture, ceramics, weaving, jewelry, photography, batik, lithography, papermaking, etching, monotype printing, and silkscreen. There are also classes on the history of art and aspects of Mexico. The web site of the instituto is http://www.instituto-allende.edu.mx, and includes class schedules and other information. I attended four weeks of the sculpture class, three mornings a week. On the first day of class, I brought a sketch of the turtle that I wanted to make, and knew that I wanted to make it from welded metal. My instructor, Jesus Hernandez, gave me some hints, and sent me down the street to buy the steel that I would need to make my sculpture. I was very pleased to be able to start making the framework of my sculpture the first day. The number of students in the class varied from week to week, but was usually around five students. Most of the students were Americans, but there was one painter from Monterrey, Mexico who wanted to learn about sculpture. The students were from 30 to 80 years old. Most of the time, I was working in the back room, the dirty part of the studio, where the welding equipment was located. The other students were working in a more typical artist’s studio environment. Generally, they were working in clay or wax on a small sculpture that would later be cast in bronze. The studio has facilities to cast relatively large bronze sculptures. I chatted with some with the other students, but mostly worked on my own. The maestro (teacher) would come by a few times each class to see how I was doing and offer tips. These tips were helpful, and I generally did what he suggested. I got what I needed in terms of facilities, equipment, advice, and time to work. I, and the other students that I talked to, had a great time, and learned a lot. The facilities were older, but quite adequate. One of their tools, a power tinsnip, was very useful, so I bought one for my own shop as soon as I returned home. I was bending steel plate with a ball peen hammer and a tree trunk with grooves and depressions cut into it. I will make myself something similar for my own shop. Like many things in Mexico, the facilities are not fancy, but they work. In an interview with the director, Sr. Fernandez, I learned that about 25% of the students are Mexicans, with 75% being foreigners. The percentage of Mexican students has increased substantially due to the recent addition of degree programs in the fine arts. The range of ages is very large, with some students more than 80 years old, many college age students, and a summer program for children. The Instituto is affiliated with the University of Guanajuato, and offers a Bachelor’s degree in Visual Arts, as well as a Master’s degree in Fine arts. Credits from the Instituto have been accepted at literally hundreds of universities in the USA. About half the students are working for credit, while the rest are attending as a form of continuing education. One of the key things that the Instituto offers is flexibility in classes. You can attend for as little as two weeks or for an entire semester, starting and finishing on the dates that are convenient for you. This flexibility is almost unique. The institute was founded in 1950, and began offering credits through the University of Guanajuato in 1951. The school was founded by Sterling Dickenson and others. It is an independent, private, non-profit organization. The campus is a few blocks southwest of the center of San Miguel de Allende. The professors and office staff are all bilingual English-Spanish. The instituto can arrange housing for you if you wish. They can reserve you a hotel room, from luxury to economy. Spanish students often choose to live with a family for a full immersion experience, and the instituto can arrange this also. The Instituto can also arrange transportation from the airport. The Leon-Guanajuato airport is about one and a half hours away, while the Mexico City airport is about four hours away. We flew into Mexico City and took a bus from the airport to Queretero, and a taxi from the bus station in Queretero to the apartment. On the way back, we took a luxury ETN bus from San Miguel de Allende to the Mexico City North terminal. I suggest the bus from the Mexico City north terminal to San Miguel de Allende, more economical and about as convenient. As part of their educational program, they offer non-credit educational tours to Mexico City, Guanajuato city, Queretero city, Michoacan, and other places of interest. 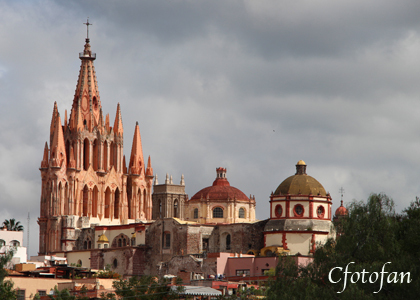 The town of San Miguel de Allende is about four hours north of Mexico City, in the state of Guanajuato. It is a national historical monument, with cobblestone streets, stone buildings, and lots of history, especially relating to the Mexican War of Independence. The town is named after General Allende, a hero of that war. San Miguel has a large expatriate community, perhaps 3000 full-time foreign residents. The expatriates are very active in terms of civic work and cultural events. We attended several concerts, two plays, and a Mexican patriotic fiesta during our stay. There is a lot of English spoken. Parking and driving are challenging, but taxis are not expensive, and most things are in walking distance from the center of town. Housing and other prices are similar to those in many parts of the USA, due to the American impact on the local economy. We rented an apartment for the month, which worked out well for us. The altitude is 6200 feet, and the climate is more or less ideal. In January 2002, we had a few cold days, including two days of rain, but the weather was mostly very pleasant, and often warm. We have also been there in the summer, which is wetter, but still pleasant. The best web site for San Miguel information is probably http://www.infosma.com Any Mexico guidebook that covers central Mexico will discuss San Miguel in detail. There is a book called the “Insiders Guide to San Miguel” that tells you almost anything that you would want to know about San Miguel, including where to buy the freshest chickens. The Insider’s guide is updated annually, and is useful for a long term visit to San Miguel. I very much enjoyed my sculpture class at the Instituto, and would recommend their art program based on my own experience. I have no personal experience with their Spanish program, but know that it is popular and has been offered for more than fifty years. San Miguel is a very nice colonial town with lots of history and an amazing variety of cultural events. It is a good place to stay while you take classes at the Instituto. La Escuela Superior de Arte del Instituto Allende ofrece una Licenciatura en Artes Visuales y la carrera de Técnico Superior Universitario, incorporadas a la Universidad de Guanajuato, es un programa orientado a la formación de artistas visuales multidisciplinarios con énfasis terminal en Pintura, Escultura, Grabado, Fotografía o Artes Aplicadas. La Escuela de Artes y Oficios del Instituto Allende ofrece talleres de Dibujo y Pintura, Joyería, Tejido en Telar y Bastidor, Fotografía, y otros. La Escuela de Arte para Niños ofrece diferentes talleres durante el año para mantener ocupados a los chiquitines después de la escuela, en actividades creativas. Durante los meses de verano, se imparte un programa especial. La Escuela de Español del Instituto Allende imparte programas intensivos, semi-intensivos y de conversación para extranjeros. This entry was posted in captures, culture, fotografías, fotos, gallery, Images, imágenes, photos, pictures, travel and tourism, turismo and tagged art classes, clases de arte, clases de español, Instituto Allende, México, San Miguel de Allende, spanish language classes. Bookmark the permalink. ← Rae George’s paintings at El Muro, San Miguel de Allende.